Last Post! 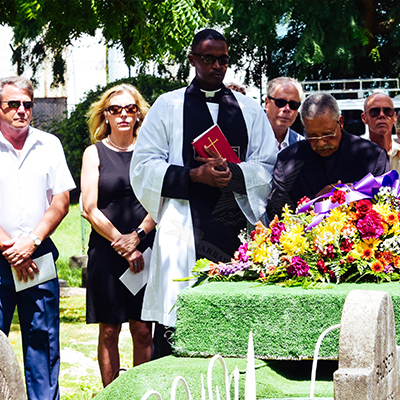 World War 2 Veteran Squadron Commander Cecil Owen Ellison (Reveille 28 Sept 1919 – Last Post 30 Sept 2018, age 99) The Barbados Defence Force honoured World War 2 Veteran, Squadron Commander Cecil Owen Ellison’s wish to be interred in the Military Cemetery. Owen Ellison was one of the last survivors of the Royal Air Force’s (RAF) lesser-known but most successful campaigns of the Second World War: the mining of the River Daube between April and October 1944. This action disrupted the supply of oil from Romania to Germany. He flew 42 operational sorties during the war against targets across Europe. He remained in the RAF and was later involved in secret missions to parachute agents into North Korea. He was promoted to Squadron Leader in 1954 and retired in 1959. After leaving the RAF, Ellison was employed by a firm of book publishers as its salesman in the Caribbean. His duties brought him to Barbados where he eventually resided and married Jean Edgehill, a native Barbadian. In Barbados he bought a guesthouse with 12 bedrooms called Sunset Lodge, which he ran as a business. In 1965 he sold Sunset Lodge but managed a chain of hotels for a Canadian company such as Discovery Bay, Tamarind Cove, the Colony Club and Coconut Creek. Squadron Commander Ellison was renowned for his dance moves on the local hotel circuit and was affectionately known as “commander”.